BOSTON – At certain points in our lives, we ask ourselves: How did we get here? 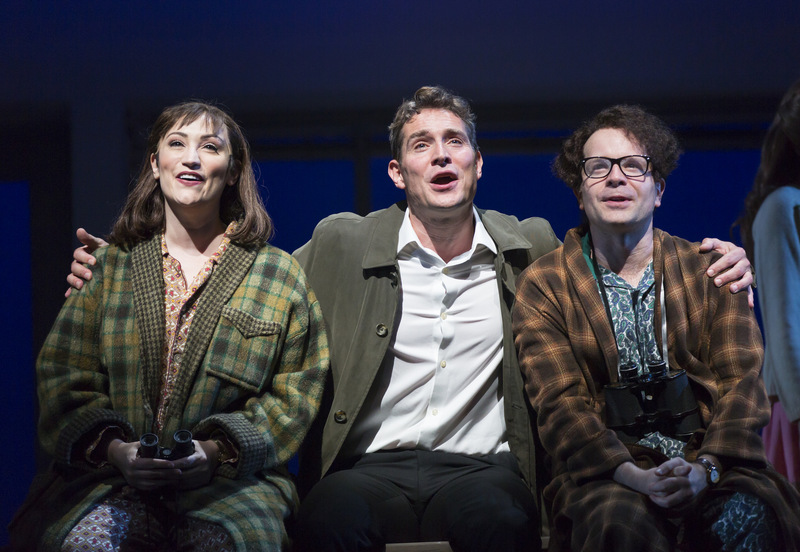 It is a question noted composer and now successful film producer Franklin Shepard is asking himself as the musical “Merrily We Roll Along” opens at the Huntington Theatre Company. The 1981 musical, based on the 1934 play of the same name by Moss Hart and George S. Kaufman, was one of famed composer Stephen Sondheim’s “noble failures.” It ran for 52 previews and 16 performances on Broadway and marked the end of Sondheim’s prolific and successful partnership with Harold Prince that produced so many of his hits . There have been changes along the way in various stagings, but the success it never achieved on Broadway it found with a hugely successful 2013 run in the West End of London, under the direction of Maria Friedman and starring Mark Umbers as Franklin Shepard and Damian Humbley as his longtime partner and friend, Charles Kringas. All three are part of this production and are joined by Eden Espinosa as Mary Flynn, the third member of the trio of close friends. Some attributed the Broadway failure to the play’s structure, which runs in reverse, beginning in 1976 and ending back in 1957. At one point, director Harold Prince had actors don sweatshirts with the names of the characters to avoid confusion. Yes, the book by George Furth based on the Hart-Kaufman play is still a bit clunky, but at no time during the 21/2 hours of this production are theater-goers ever losing track of who’s who and who’s doing what, a tribute to Friedman’s smart direction, which flows seamlessly back in time. “Merrily” opens in 1976 at Shepard’s beach house at California, where the now-film producer is celebrating a successful movie at the same time he is mourning the emptiness of his life and the end of his friendship with Charlie, his former lyricist and now a playwright. It is a palpable moment of regret. It is also an occasion for a bitter drunken rant by Espinosa as Mary Flynn, a writer and theater critic who has carried a torch for Franklin for 20 years, and can’t hold it in anymore as yet another of Franklin’s relationships crashes and burns and a young starlet waits in the wings to comfort him. The plot unspools back to sunnier times, to Franklin and Charles’ Broadway success, and Mary’s best-seller. After casting the leads, the Huntington mined the local theater community’s cavalcade of talent, and they are up to the task in both important roles and supporting turns. It starts with Aimee Doherty as the glamorous Broadway star Gussie Carmody,who is involved with Franklin first as friend and mentor, then as mistress, later as his wife and ultimately as an about-to-be ex-wife. She gets to show off her considerable vocal talents in “Musical Husbands Finale,” part of a hit show written by Franklin and Charlie. Jennifer Ellis is Beth, Franklin’s first wife and the mother of his son, and she is up to the task of performing the heartbreakingly beautiful “Not a Day Goes By” in 1967, in the middle of her divorce from Franklin, and later in Act II as part of her wedding vows that eventually resound bitterly. And while most of the play’s characters find their stars rising, Christopher Chew’s character of successful producer Joe Josephson, who helped make wife Gussie a Broadway star, has as the play begins been reduced to begging her for handouts. Robert Saoud has some nice moments as Beth’s father, not all that enthralled with the prospect of Franklin as a son-in-law. Other local stalwarts who are part of the formidable ensemble include Maurice Emmanuel Parent. Amy Barker, Jessica Kundla, Carla Martinez, Patrick Varner, Pablo Torres and Ceit M. Zweil. The storyline details how Shepard came to lose both his moral and artistic compass while Kringas, the happily married partner, is forced to dissolve their partnership and let his old friend go his own way. Mary suffers a litany of personal woes as her love for Franklin brings only frustration and heartbreak. The trio of friends at the center of the piece are flawed. As they make their way back to the beginning, we root for them in their earlier incarnations and rejoice in their celebrations, even as we know what lies ahead, and that the bonds that seemed unbreakable will one day fray and break. The score will reflect that journey, from the cynicism and phoniness of the Hollywood Scene in “That Frank” back to the time when anything is possible, the rousing anthem “Our Time,” set two decades earlier. Furth and Sondheim ultimately connect the dots in 1957, with “Our Time” and a final scene that is loaded with both irony and hope. The 10-piece orchestra led by Matthew Stern performs the score with clarity and the music is in perfect balance with the vocals. The choreography by Tim Jackson and his adept staging of party scenes will recall an earlier Sondheim show “”Company” – while Souta Gilmour’s costume designs are en pointe in the scenes that take place in the 70’s and 60’s. This production makes it s solid three-for-three, and we confirmed Sondheimophiles eagerly await what Huntington Artistic Director Peter DuBois has in store for us in the future. 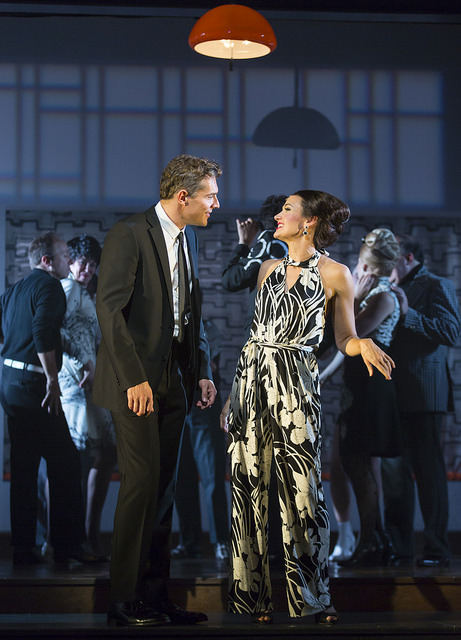 The Huntington Theatre Company production of “Merrily We Roll Along.” Music and lyrics by Stephen Sondheim. Book by George Furth, based on the play by George S. Kaufman and Moss Hart. Directed by Maria Friedman. At the Huntington Avenue Theatre through Oct. 15. huntingtontheatre.org.